Beautiful colors and pattern. Would recommend. Well Woven Traditional Sarouk Non-Skid Backing Area Rug - 3'3" x 4'7"
This Euro Home rug features a beautiful floral pattern and a soft texture. This rug is finished with a rubber backing to keep it in place. This transitional rug offers a pile height of 0.31 inches and is the perfect thickness and texture for any room including high-traffic areas. Constructed of nylon, this gorgeous home accent boasts both beauty and durability. Available in an exquisite multicolor design, the splendor of this rug will light up a home or office. We ordered this rug after having two with the same pattern that we love. This one had small imperfections in the print. It's as if some of the dye pulled up as the rug was rolled up for shipping. There are small white specs that almost look like bits of fuzz on the rug. We are using this rug under a table and chairs, so we're willing to live with the flaws. I'd give the rug 5 stars otherwise. It's your basic nylon rug, but the print is nice. This is not BLUE. It's more like teal/green. So if you are purchasing this to match a blue color theme, you might want to select a different item. At first I thought they sent me the green version of this rug since it's SO green, but the tag on it said blue. I got this rug to spruce up an area in my family room and it fit the bill perfectly. The color is really nice and cheers everything up. 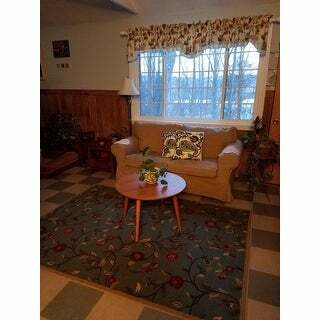 Nice rug &gt; the colors are a bit darker than what the picture shows. However, is perfect for my kitchen for an “area rug”. I wish it was more shaggy. This rug is like a turquoise color not greenish at all. It's on the thin side but pretty. It vacuums up nicely. I love this rug. It's beautiful and easy to vacuum. The price was great too. Pretty and love the rubber backing! I bought this rug with my rewards and I absolutely love it! It is a beautiful rug but it's definitely darker than it appears here. Very nice area rug. Brightens kitchen breakfast nook. "I love this pattern. Does it come in 8x10? I see sage green in that size but I am looking for the blue." "Hi, two questions: Would this rug be appropriate in a high traffic entrance where boots, shoes, etc might be wet? Also, is it necessary to use a rug pad underneath this rug? Thank you." 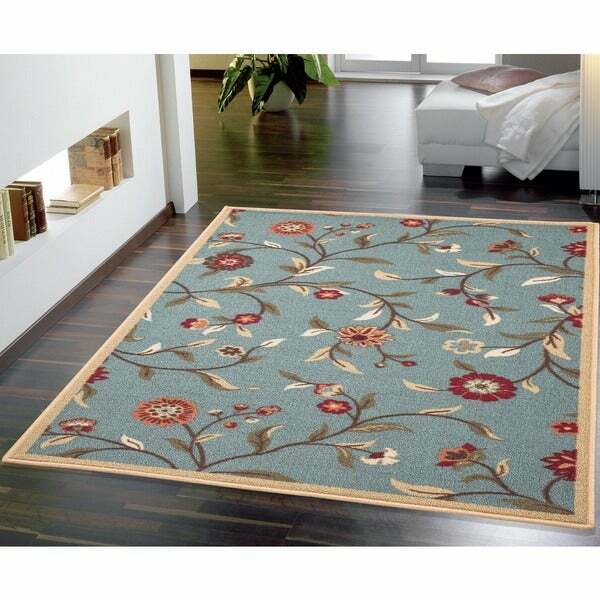 This rug is a durable rug with a lower pile so it will work well in a high traffic area. We would suggest using a rug pad, particularly when using on a slippery surface. "Are the flowers a true red? I'm looking for more of a coral. Thanks!" In my opinion this rug has cranberry flowers. I have an identical design in a 5x8 rug in our living room now. It's a reddish color. The design is great and I saw this in the bluish/green which is pretty and I ordered it. Now I can change off. looks good and easy care good price. Harmonized with new flooring. I sincerely hope you're sending the BLUE one, not the GREEN one in the little picture I'm seeing now.